Product #20876 | SKU PD02010 | 4.0 (based on 1 rating) Thanks for your rating! 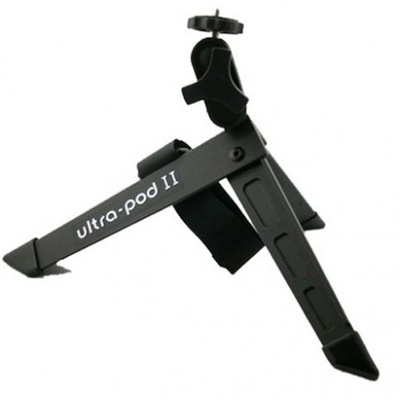 The Pedco UltraPod II is a versatile tabletop-style tripod with a mini ball head. It sits 6"(15.2 cm) high when legs are opened, folds to just 7"(17.8 cm) in length, and weighs 119 g. The tripod features a touch fastener strap to affix it to irregular surfaces and objects, or to hold it together when folded, and non-slip vinyl feet to help keep the tripod stable on slippery surfaces. The mini ball head has a 360° panning motion and a +/- 90° tilt adjustment as well as a +/- 20° angular adjustment. A 1/4"-20 threaded screw attaches to your camera's tripod mount. A little fiddly but once you get the hang of it it's fairly easy to use. It certainly beats carrying a full tripod when you're doing a multi-day hike! Good from the 3-legged position and also when using the velcro to tie to a tree.